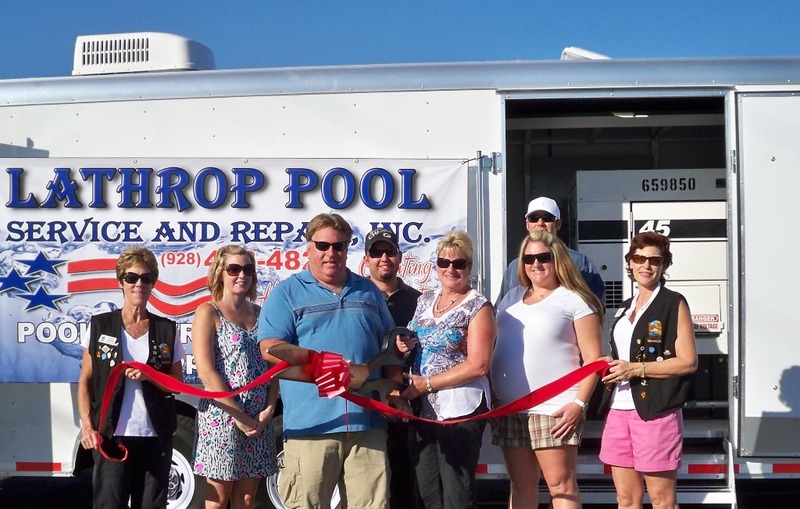 Lathrop Pool Service & Repair, Inc.
Lathrop Pool Service & Repair, Inc. has been serving local residents with their pool needs for over 13 years. They have also recently developed a process that makes your pool water as they like to put it, “Good enough to drink”. This is done with an intricate water conserving reverse osmosis system that is the only one of its kind in Lake Havasu City. Also offered are pool maintenance, pool repairs, new equipment and emergency service around the clock. On hand for the ribbon cutting from left to right is: Virginia Chambers, Rick and Susanne Lathrop, Ashley and Tony Thomas and Carrie, Chris Davis and Nancy Leamons. For more information you can contact them at (928) 453-4821.